Disclaimer: I received a free review copy of this book. The book links are affiliate links; I get a small amount from any purchase you make through them. 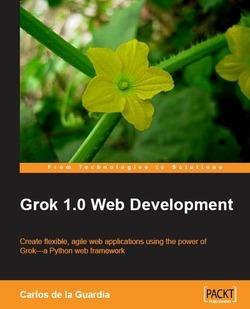 Grok is a Python web framework, built on top of the Zope Toolkit, which is the core of what used to be called Zope 3 and is now rebranded as BlueBream. Confused yet? Get used to it: the small pluggable components are the heart and soul of ZTK, and the source of its flexibility. It's not surprising that people take the same approach on a larger scale: take Zope 3 apart into smaller packages and reassemble them into different frameworks such as Grok, BlueBream or repoze.bfg. deployment (my second favourite chapter): paster, apache and mod_proxy, mod_wsgi, pound, squid, varnish, scalable deployments. Some important topics like internationalization, time zones, testing with Selenium, and (especially) database migration (which is pretty specific for ZODB) were not covered. ZODB is not as transparent as people tell you. There are many gotchas, especially if you want to refactor your code without throwing away old databases. bin/buildout is free to recursively remove anything under parts. Keeping your database there is fine only if you don't mind occasionally starting from scratch. repozo does not back up blobs. The ZODB transaction conflict resolution depends on being able to repeat requests several times; this is important if your code has external side effects (e.g. sends emails, creates files, pings 3rd party websites over HTTP). Packages like megrok.rdb or zope.sendmail take care of this; it'd be nice to be shown how to do that for your own code before you discover this issue the hard way when your app starts charging people's credit cards three times every now and then. You need to make sure you send out object events at appropriate times, or your catalog indexes won't be updated. Permission and role grants are persistent: if you delete a user and then create a new one with the same username, the new user will have all the roles and permissions granted to the old one. If you implement user deletion, you need to explicitly remove old grants. The Zope security model expects every object to have a valid __parent__ attribute; permission/role grants will not work properly on objects without a __parent__. Most of the time this is taken care of automatically, but when it's not, you can get really confusing errors. Allowing end-users to specify ++skin++ in the URL can be a security hole. Update: some other reviews on Planet Python. Update 2: Another review (well, part 1 of one, but I got tired waiting for part 2).